Schoolchildren are easily distracted at the best of times, but imagine trying to keep their attention when helicopters are flying overhead every five minutes delivering relief supplies. The fact their classrooms have no walls doesn’t help either. 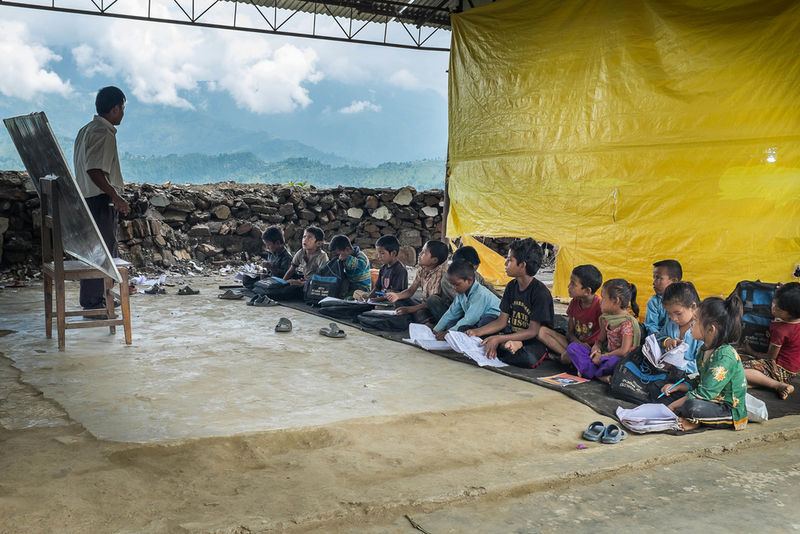 This is the situation in Nepal’s remote Kiul area, where the devastation caused by the April and May earthquakes has made life very difficult for teachers. More than a million Nepalese children no longer have access to safe classrooms, according to the Education Cluster, a group of NGOs determined to rebuild the Himalayan nation's collapsed education system. Kiul is in Sindhupalchok, one of the worst-affected districts in the country, where 95 percent of schools were damaged. Despite the destruction of much of the infrastructure, teachers and students here are determined to keep classes going. As in other quake-hit areas of Nepal, children are learning in makeshift classrooms fashioned out of tarpaulin sheets and poles. Aid groups have also built “temporary learning centres" out of bamboo or tin. They are only big enough to hold two classes. Some children are still being taught on the rubble of their former schools. Schoolchildren look at the sky as a relief helicopted flies by on 11 August 2015 in Kiul. The school completely collapsed during the earthquake and students are now attending classes under a metal roof with no walls and only white boards separating each class. A village destroyed by the earthquake can be seen in the distance on 10 August 2015 in Sindhupalchowk district. Schoolchildren sign the national athem on 10 August 2015 in Sipa Pokhari on the grounds of their school where all buildings were damaged or completely destroyed in the earthquake. Children attend a class where their school once stood on 10 August 2015 in Sipa Pokhari. The school now only has one temporary learning center set up by NGOs, which has just two classrooms. The rest of the students attend classes underneath a metal rooftop, with no walls and only tarps to separate each classroom. Students attend classes inside earthquake-damaged school buildings on 10 August 2015 in Sipa Pokhari. Students play volleyball during a break in classes near the temporary learning center set up on the grounds of their school on 10 August 2015 in Bhotsipa.